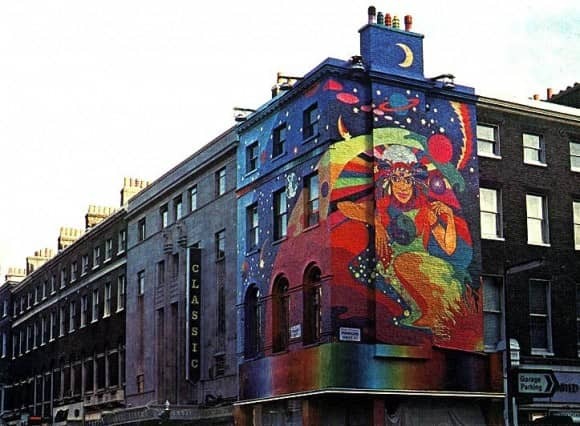 Two days ahead of the opening of The Beatles' Apple Boutique at 94 Baker Street, London, a launch party and fashion show was held in the building. Invitations to the party read 'Come at 7.46. Fashion Show at 8.16.' The times had been chosen by John Lennon. Lennon and George Harrison were the only Beatles to attend the launch; Paul McCartney was on holiday in Scotland, and Ringo Starr was filming Candy in Italy. As there was no alcohol licence at the boutique, the only drink available was apple juice. Various celebrities were in attendance, and Lennon, Harrison and Cilla Black were interviewed by radio reporter Brian Cullingford for the BBC. It was broadcast at 10pm on Late Night Extra.